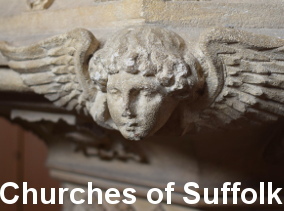 This is a glossary of the technical terms used in entries in Simon's Suffolk Churches. The glossary is organised in alphabetical order; click on the word you want to find out about, and a definition of it will appear in this window. However, it is not necessary to keep coming back to this page. Every time one of these words is mentioned in an entry, a link will take you directly to a definition in a new window. By clicking on the 'glossary' logo at the top of the page, you will get to this index. If there is anything you would like to see added to this glossary, please let me know.